The legendary GUNS N’ ROSES is making history on their seemingly impossible “reunion” tour; (in fact the tour’s byline is ”Not In This Lifetime”). All the same, they are tearing it up, coast to coast this summer. 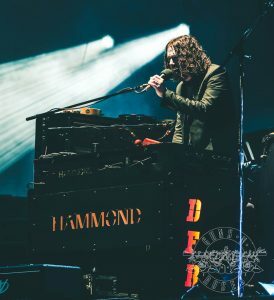 And Hammond Artist DIZZY F. REED makes it even heavier driving his custom-designed Hammond XK system onstage. You can’t miss him, with the large-scale “Hammond” logo emblazoned on the front of his rig. Congrats to Dizzy and the Band for bringing the Rock once again.